Beautiful to look at and tasty to boot - this butternut and walnut pasta is a stunner of a dish. If you use wholegrain spelt or wheat pasta, or pasta made from pulses, then it’s even tastier and healthier. I love wholegrain spelt spaghetti (I buy biona organic spelt spaghetti from a health food shop). It is so utterly tasty on its own, and much healthier and much better for your weight than plain white spaghetti. I also love pasta made from pulses but it's not always easy to find. 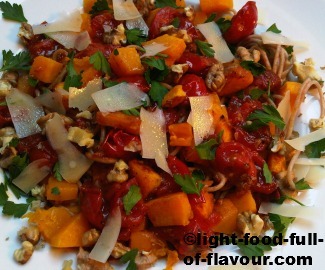 Now, I am placing this butternut and walnut pasta dish under vegetarian recipes but I do use anchovy fillets in the recipe. I have friends who are pescetarians and they would of course be fine with this. If you are a strict vegetarian, then simply leave out the anchovy fillets and add a bit of salt in its place. 1. Pre-heat the oven to 220C/Fan 200C/425F/gas mark 7. Place the diced butternut squash in a roasting pan, drizzle over a bit of olive oil, season with salt and toss everything together. Place the roasting tin in the oven for about 25 minutes – stir midway through – until the diced butternut is tender. 2. Put a large pan of salted water on to boil. Place the walnut pieces in a frying pan over a medium high heat and dry-fry for 2-3 minutes, until they start to brown slightly and smell wonderful. Remove the walnut pieces from the frying pan and allow them to cool down. 3. Add 1 tablespoon of olive oil and the chopped anchovy fillets to the frying pan over a medium high heat. Keep stirring until the anchovy starts to break down. Add the crushed garlic and continue to cook for a further minute. Add the tomatoes, balsamic vinegar and season, quite generously, with black pepper. Stir, lower the heat and simmer for about 5 minutes. Keep warm. 4. Cook the spaghetti according to packet instructions and then drain. Return the pasta to the pan, add the diced butternut squash and the anchovy-tomato mix and gently toss together. Divide the pasta between four shallow bowls and top each plate with some walnut pieces, chopped parsley and Parmesan cheese shavings.